Tough, versatile and ready for almost anything, our 16mm 6×36 stainless steel wire rope with a 6×36 strand configuration with make short work of lifting tasks in the trickiest of environments. 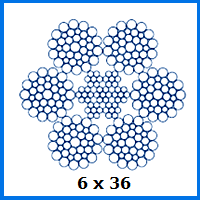 For thicker or thinner counterparts, check out our full 6×36 rope range. Although its 16mm diameter is not especially chunky, this rope can still boast a hefty load capacity. Select the example with a wire core and the WLL reaches 14,585kg. Opt for the fibre core edition and this drops to 13,520kg. If you are not sure why you would settle for fibre core rope given this discrepancy, the main advantage is improved flexibility. The weight of this weaker core is also lower, which may be an advantage in certain circumstances. Our wire rope range is very varied, covering industry-specific options like theatre rope and forestry rope as well as general purpose compacted rope. When it comes to stainless steel, the rope made using this material has the advantage of being able to beat back corrosion while presenting a polished exterior to the wide world. Stainless steel rope is perfectly capable of thriving in moist environments, where other metals would falter. The fact that it looks good too is what helps enhance its appeal that little bit further. Choose a wire rope product and then give us a call on 01384 78004 to place an order. Rope Services Direct can also be emailed via our site, which may be more convenient. 16mm 6x36 Stainless Steel Wire Rope Overall rating: 5 out of 5 based on 6 reviews.